^ a b "Jarno Trulli to race in Formula E with own TrulliGP outfit". Formula E Operations. FIA Formula E Championship. 18 June 2014. Retrieved 18 June 2014. ^ a b c d e f g h i j "Spotters guide to Formula E". FIA Formula E Championship. Formula E Operations. 12 December 2014. Retrieved 18 December 2014. 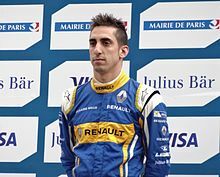 ^ a b "Jaime Alguersuari and Sam Bird join Virgin Racing". Formula E Operations. FIA Formula E Championship. 13 May 2014. Retrieved 13 May 2014. ^ "Leimer replaces Alguersuari for London". Formula E Operations. FIA Formula E Championship. 23 June 2015. Retrieved 23 June 2015. ^ a b "Karun Chandhok and Bruno Senna sign for Mahindra Racing". Formula E Operations. FIA Formula E Championship. 26 May 2014. Retrieved 26 May 2014. 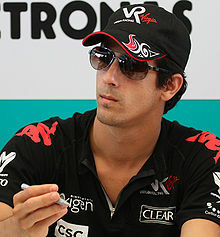 ^ "Oriol Servia to race for Dragon in Beijing". Formula E Operations. FIA Formula E Championship. 5 September 2014. Retrieved 5 September 2014. ^ "Duval gets Dragon seat for Miami". Formula E Operations. FIA Formula E Championship. 9 March 2015. Retrieved 9 March 2015. ^ "Jerome d'Ambrosio to compete in Formula E with Dragon Racing". Formula E Operations. FIA Formula E Championship. 22 July 2014. Retrieved 22 July 2014. ^ "Matthew Brabham to race for Andretti in Putrajaya". FIA Formula E. 20 November 2014. Retrieved 20 November 2014. ^ "Scott Speed to race for Andretti in Miami". Formula E Operations. FIA Formula E Championship. 5 March 2015. Retrieved 5 March 2015. ^ "Justin Wilson to race for Andretti in Moscow". Formula E Operations. FIA Formula E Championship. 27 May 2015. Retrieved 27 May 2015. ^ "De Silvestro to race in Visa London ePrix". Formula E Operations. FIA Formula E Championship. 14 June 2015. Retrieved 15 June 2015. ^ "Spotters guide to Formula E". FIA Formula E Championship. Formula E Operations. 21 May 2015. Retrieved 28 May 2015. 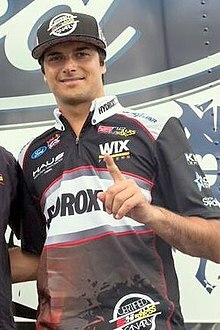 ^ "Nelson Piquet Jr. and Ho-Pin Tung sign for China Racing". Formula E Operations. FIA Formula E Championship. 21 August 2014. Retrieved 21 August 2014. ^ "Tung returns for Buenos Aires". FIA Formula E Championship. Formula E Operations. 31 December 2014. Retrieved 31 December 2014. This page was last edited on 31 March 2019, at 08:26 (UTC).